Cúl Camps is the GAA’s action-packed and fun-filled summer scheme programme, an all-Ireland initiative with involvement from over 400 camps, managed by 34 camp coordinators. To simplify the online booking process, improving ease of use across all devices. With a phenomenal 21% increase in online bookings vs previous year. 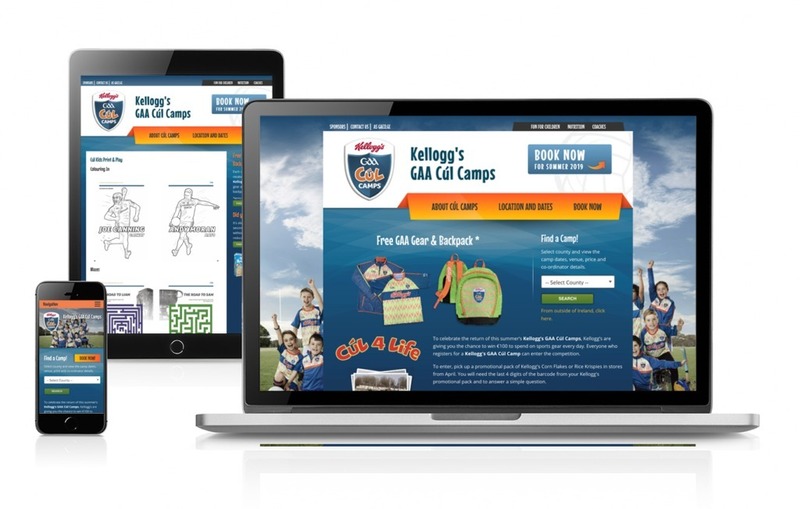 The new site delivered over 72,000 online bookings, an extraordinary result for GAA Cúl Camps. We have worked in partnership with GAA on the Cúl Camps project for over 10 years. At project outset our Account Management Team facilitated a Requirements Workshop to ensure we fully understood the requirements and scope of the project. Each year GAA collect feedback from end users and internal Content Management System (CMS) users on usability of the website. GAA then share the information collated to assist with goal setting and User Experience (UX) understanding. This information is vital in order to refine and improve the website year on year. Further to this our extensive scoping and analysis phase ensured we had a comprehensive understanding of the pain points within the booking process and enabled us to improve these for users. To improve both the front and back-end functionality of the booking process we decided to build the new website using Symfony. After extensive research and analysis, we overhauled the front-end user registration and booking, simplifying the flow and the functionality. We identified a higher than average drop off rate on the previous registration and booking process and as a result the booking process was refined and streamlined. A key addition was the ability to add multiple children to multiple summer camps on a single booking. We also worked alongside the Cúl Camps Team to simplify the pricing model and ensure the multiple booking/ child discount model was clear. Other key requirements of the booking process were facilitated within the new site: transfer between camps, cancel a registration, add multiple children and add multiple camps. The site was built using Symfony and we integrated Sonata as the chosen CMS to manage site content. We built a custom dashboard to concisely and clearly present key information to CMS users. The custom dashboard displays key data at a glance for camp coordinators, Finance Team and Administrators. The website visual Design is clear and uncluttered, adhering to Cúl Camps brand guidelines and utilising the brand colour palette. We ensured the navigation was simple and intuitive, ensuring time poor users can complete their required tasks quickly and efficiently. A key priority of the site Design was to ensure prominence was placed on Kellogg’s branding as principal sponsor of the programme. As part of our commitment to visitor satisfaction, we place utmost importance on site Accessibility. We have an exceptional record in developing websites that are accessible to all users regardless of physical or technological readiness. Accessibility is tested throughout the whole design and development process – from visual design to front end development and prior to go live. Accessibility tools: WCAG 2.0 AA & Section 508, CynthiaSays, WAVE, AChecker, HTML Validity, W3C Mark-up Validity Service, BrowserStack. The new Cúl Camps site was launched prior to the new season sign up and the Zesty Account Management Team managed the launch plan, ensuring a seamless transition to the new site. With a phenomenal 21% increase in online camp bookings in 2018, the new site delivered extraordinary results for GAA. We are committed to the advancement and sustainability of the Cúl Camps site. We’ve recently met with the client to review the site performance (including analytics) and our planning and implementation is underway for 2019. We utilise the GAA’s user feedback to make refinements, ensuring we are evolving the site year on year and maximising its potential to process more bookings and increase revenue.